Spock speaks with a Romulan Proconsul in hopes of achieving reunification between Romulus and Vulcan, but the Romulan leadership has other plans. These two episodes are best looked at as a single narrative, and the title, "Unification," refers to several different things. The most obvious, of course, is that the central plot concerns a growing movement to reunite the Romulans with the Vulcans, but this is hardly the main thrust of the episode. From a purely emotional standpoint, this is the story of unifying the rift between Spock and Sarek. It starts with Sarek's death, leading to the anguish that comes from things unsaid between loved ones. This is subject matter that speaks to the human condition. 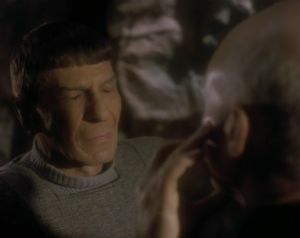 Picard then spends the entire two part episode carrying Sarek's last wishes of making peace with his son to Spock, ultimately offering him the mind meld at the very end. You can take this theme even further, and the writing invites you to do this. There are several scenes in which characters talk about the rifts between young and old, about how stubborn traditions can be defeated by the idealism of youth. It is about how willing people can be to change or to meet an intellectual adversary halfway, how argument can be valuable and important. This is also the story of unifying TOS with TNG. Spock comes right out and compares Picard to Kirk, and he and Data share a wonderfully written scene where they talk about the value of humanity and logic. (Data, who is in many ways the Spock of TNG, even gets to do a Vulcan neck pinch.) Instead of the old and the new trying to compete with one another, they should be seen as embracing their own differences and similarities. As for the storytelling itself, it tries to be epic, but falls victim to a few little problems. I absolutely love the stuff with the alien organ player, the Klingon opera, and the fat Ferengi--and I like how we get to see Riker in command without everything going wrong--but the B-story jumps around unnecessarily, with big gaps that needed to be closed in the writers' room. It starts awkwardly, and how the two storylines relate is only explained at the end. The starting points for the two stories should be more cohesive instead of coincidental, and there is absolutely no thematic connective tissue. The other big weakness of the episode is in its rushed climax. After much build-up, the reveal that Pardek is a villain comes out of left field, the scene in which Sela explains the plot to our heroes and then leaves them alone is cliché, and the entire solution hinges on Data being able to work magic with a single Romulan computer console. The holographic wall is fun but almost a deus ex machina, because the holographic mechanism first appears mere minutes before our heroes use it. I also have to add that Sela is again used as a one-dimensional baddie and nothing more; it would have been nice for her to have more thematic relevance. Finally, one of the young Romulans is Artz, and he never explodes. Still, I don't want to leave you with the impression that this is a bad episode, because it most definitely is not. There's a lot of good acting going on, and the emotional impact of Spock and Sarek's story is strong enough to make up for any shortcomings in the plotting. There is also some good character development for Picard and Data, development that is critical for where they will go from here. Alas, despite her potential as a character, we never hear from Sela again. That is one of TNG's most disappointing oversights.